Malta is the largest of the three Maltese Islands - the others are Gozo and Comino. These colourful islands lie at the heart of the deep blue Mediterranean to the south west of Sicily. There are 7,000 years of history to be found on Malta and the island has often been described as one big open-air museum, so it will come as no surprise that the Royal Malta Golf Club comes with a great deal of history too. The Maltese Governor and Commander in Chief, Sir Henry D'Oyley Torrens, founded Royal Malta in 1888. Sir Henry took golf with him on his journeys around the world with the armed forces, having previously set up the Cape Golf Club (the forerunner of Royal Cape) in Cape Town, South Africa, some years earlier. On Sir Henry's command, the British Forces laid out a nine-hole course around the dry moats that surround Valletta. The club moved to its present location in the Marsa Grounds in 1904 and an unknown architect, probably serving with the British Forces, laid out the course on a relatively small parcel of land. The Army handed over the Royal Malta Golf Club to the Maltese members in 1971 and it has since benefited from a raft of improvements, including a sophisticated irrigation system, which ensures lush green fairways all year round. Royal Malta is not a long course, measuring a little over 5,000 metres from the men's tees (par 68), but this is a very enjoyable course with plenty of well-placed bunkers guarding the greens, and cunningly placed traps on the fairways. Additionally, there are a few water hazards, which will test your accuracy from the tee. The history of Royal Malta is evident on the 6th, a par 3 called the “Maids' Bedroom” and, avoiding any reference to the likelihood of getting a birdie, it should be noted that the reason for the naming of the hole is that you have to tee off across the remains of the house where golf club's maids once lived. The closing 18th looks straightforward, but closer inspection reveals numerous hazards and the additional burden of out-of-bounds along the left hand side of the fairway. As with many holes at Royal Malta, this is a hole that can lull you into a false sense of security, and on many occasions there are holes that are typically, 'risk and reward', such as the 10th, with a well-placed water hazard some 180 metres from the tee. Royal Malta plays over relatively flat ground and this is welcome given the pleasantly warm all-year-round climate. 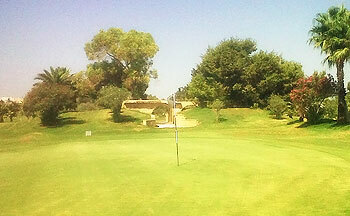 Royal Malta is also a pretty course, which is immaculately maintained and also fair to the higher handicap golfer. No trip to this beautiful island would be complete without a game at the historic Royal Malta Golf Club. The one and only golf course in Malta offers 18 holes of golf in stunning, historical, landscaped grounds, which are maintained daily. We‘re played twice here and one of that was day before Turkish Airlines tournament. Par 68, the course is average challenge for the more experienced, without being unkind to the novice! Cozy and nice golf club with history. Good restaurant and food. Prices are acceptable. Condition was very good, especially greens. Actually greens was championship level! One note: greens are firm and usually better to land ball at the front of them to run up to the pin. Golf cource is not very challenging. First two par 4 holes are quite short with possibility to reach greens from tee. The 6th is the Club’s signature hole. Club selection is critical on this testing short par 3 as the long green is guarded by hidden bunkers front left and right. The pin may be difficult to see, but you should be able to catch a glimpse through the arch. The 8th hole par 5 one of the best with a slight dog leg to the left. The drive needs to be accurate as the fairway is narrow with trees guarding the right and a water hazard running all the way down the left. Long hitters can reach green with their second shots with a chance for a birdie. The green slopes to the left in the direction of the water hazard so play your approach carefully. The next interesting is 12th with an intimidating tee shot on this par 4 as the best line is to cut the corner over the palm trees and the water hazard onto the lower level of the fairway. But if you are short or unlucky, trees may block your second shot to the green that is on a higher level with dead ground between the top of the ridge and the front of the green. The last two are easy holes to relax and finish course with good result and mood. Good service provided here from arriving to leaving with friendly and helpful staff. Easy to book tee time through internet and quick confirmation receiving is big advantage. Also we got new Taylor Made M4 set for rent at regular clubs price! Golf cart good and well equipped. I will be back next my visit to Malta! The club is approaching its 125th anniversary and a number of measures are being undertaken to spruce up the layout, not least of which is the renovation of the tee box areas. Consequently, when I teed it up here today, the already short 5487-yard course was playing considerably less than that – not that that helped me amass any more Stableford points in the 30c+ heat and (what felt like) 100% humidity. The highlight of the front nine is the “Maid’s Bedroom” at hole 6, the middle par three in a run of three consecutive short holes. Measuring 154-yards from the gents yellow tee, the hole is played over an earth bank that has a stone lined walkway leading to the green cut through it so the only look at the flag is through this narrow alleyway – what a unique an utterly charming little par three! There are plenty of subtle little elevation changes throughout the round here, with many of the greens raised to repel approach shots. Dry creeks cross a couple of the fairways on the back nine to keep you mentally alert and there’s a few old-fashioned examples of crossing fairways (like the 12th and 13th, 17th and 18th) to keep you engaged right to the very end. In a nut shell, I loved this place; it’s hemmed in on all sides so every inch of available land is used - leading to three par threes at holes 5 to 7 and two more at 16 and 17 - but that’s what I like to see, clubs making the most of what they’re given in terms of the land available when constructing a course. A modern architect would rip the place up and start again but that would remove the allure of a lovely old track that will very soon be complemented by a very attractive new clubhouse. I played the course just before the club championships and it was in lovely condition. The greens were reasonably paced and no a mark on them. The course although short is well laid out and takes maximum advantage of the space available. A good drive will often leave you with a half shot so I would recommend clubbing down. Greens are firm and it was often better to land at the front and run up to the pin. Clubhouse is very pleasant, good food, and very good showers.